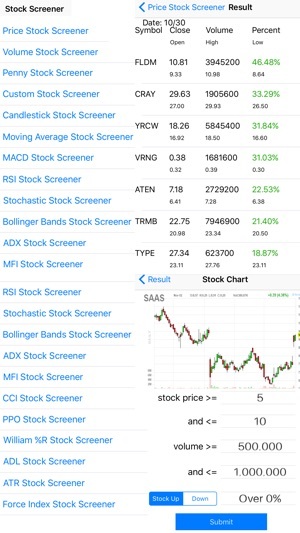 Stock Screener is a free stock market app that search the US stock market based on technical analysis and stock chart patterns for stock trading. This is a technical stock screener or stock scanner, not a fundamental stock screener. If you do online stock trading, such as swing trading or day trading, you will like this stock screener app for iPhone. You can find stocks that you want to trade to your stocks to watch list. This is an end of day technical analysis stock screener, meaning the stock quotes are updated at the end of the day. We do not offer real time stock quotes for our technical stock screener. You need to have a basic understand of how the stock market works in order to utilize this technical analysis app. This free stock screener app does not teach you how to trade stocks, nor does it recommend you any stocks to buy. You have to do your own stock market research and buy stocks on your own risk. The stock charts within this app are from Finviz. They have copyright to the stock chart. The stock charts uses intraday data which is delay by 15 minutes. 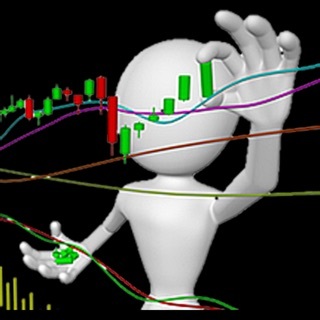 There are many technical indicators that you can scan the stock market for swing trading. You will see stock charts and stock market news when you click on any stock on the result page. This stock scanner scans for stocks based on technical indicators only, it does not have any of the fundamental analysis data like PE ratio. If you are looking for a fundamental stock screener, this app is not for you. 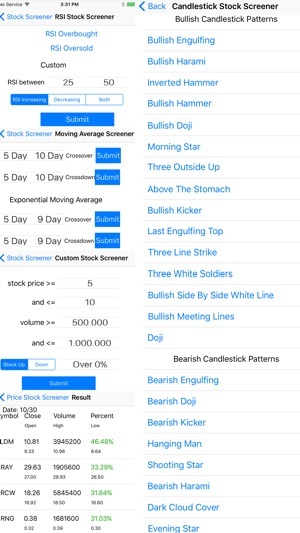 Below is a list of the most popular stock chart patterns and technical indicators that you can use with our technical stock screener app. RSI Stock Screener - RSI Screener find oversold and overbought stocks and stocks with RSI increasing or decreasing. MACD Stock Screener - Macd Screener search for MACD crossover, cross down patterns. Daily Stock Gainers and Losers - Get top stock market gainers and losers. Price Stock Screener - search stocks based on stock prices. Volume Stock Screener - search stocks base on high volume stocks or stocks with unusual volume. Penny Stock Screener - search for small cap stocks and penny stocks under $1, stocks under $5, stocks under $10. Candlestick Stock Screener - candlestick screener allows you to scan for the most popular candlestick patterns. CCI Stock Screener - identify stock trend or warning of extreme conditions when a stock is overbought or oversold. William %R Stock Screener - technical indicator to find overbought and oversold stocks. Force Index Stock Screener - technical indicator that uses stock price and volume to identify strength of a stock trend. This is one of the best stock screener app for iPhone that you can use for free. If you're looking for a swing trade screener this is a very solid app. It is the free version so there isn't as much flexibility as Pro but it does the job. You'll need to play with the settings to get what you want out of it but I really like it. If all you are interested is an overview without any description on the stock that you are looking at then this app is for you.